Football is not wanting of phenomena. There have been phenomenal players, phenomenal tricks, goals, passes, plays – we have seen it all. Phenomenal teams have packed stadiums throughout history, leaving masses numbering in the thousands (and the millions tuning in) in sheer awe of their ability. Whether it be a dummy, an elastico, or a goal from the centre circle, these nigh-fantasy heroics seldom fail to astonish. But as fans continue to drape their idols in superlatives otherwise fitting for royalty, if not the gods themselves, there is a precedent that humbles any such footballing mogul: the legendary Brazilian side of 1970. Eight years prior, at the Estadio Nacional in Santiago, Chile, Brazil celebrated its second successive World Cup after defeating Czechoslovakia 3-1 in the final. The celebrations did not retire for days and star men Garrincha and Pelé, despite the latter missing most of the tournament through injury, were now heralded as national icons. The ecstasy brightly burnt out. The festivals on the streets had surrendered to the grimmer realities of the time. In 1961, amidst much confusion, João Goulart assumed the office of president in Brazil. He had previously been the vice president but when the incumbent leader, Jânio Quadros, resigned from the presidency, Goulart was promoted to lead the country. His subsequent reforms greatly polarised the public. Goulart wanted to nationalise certain industries to build a stronger domestic economy and diminish the economic rift between Brazil and the USA. Fearing that the reforms were the initial steps to join the Communist Bloc, many Brazilians and the parliament alike withdrew their support. Influencers dubbed him a communist and began the call for a coup d’état. On 1 April 1964, with rebel troops already in Rio de Janeiro, Goulart thought to spare the trouble of a civil war and fled to Uruguay. Ten days hence, the Chief of Staff of the Brazilian Army, Marshal Castelo Branco, was elected president by Congress. The coup ousted Goulart and his contentious reforms to much of Brazil’s favour, yet plunged them into even deeper political turmoil. Castelo Branco greatly expanded the power of the presidency. Any incumbent could now change the constitution to his or her liking and fire any political figure. Branco’s successor, General Artur da Costa e Silva, signed in a new act that effectively dissolved Congress, enforced censorship, and further increased the president’s powers to equate to those of a dictator. Unable to serve out the rest of his term due to his health, Costa e Silva was replaced by General Emílio Garrastazú Médici. Assuming office in 1969, Médici wholeheartedly embraced the Brazilian military regime’s slogan, “Brasil: ame-o ou deixe-o” (Brazil: love it or leave it). Following years of rising inflation, slow economic growth, and social unrest, Médici sought to change the climate however he deemed fit. Under his tenure, repression and torture ran rampant. Journalists were heavily censored and dissidents, falsely accused or not, were imprisoned without trial. To say there was social unease under Médici’s dictatorship would be the kindest way to phrase it. To quell the masses, Médici found his alternative bread and circuses: football. No political regime is wholly supported by its populace. Brazilians, however, revere the national team. To some locals, football means life. To many others, it means much, much more. Médici wanted his government to be seen in tandem with the national team – footballing success would mean political success. It was a means of controlling the discontent mob, but his heavy involvement in football was rather forced nor welcome. He sanctioned the building of numerous new stadiums throughout the nation. High on personal pride, Médici continued to interfere directly with the sport, commandeering team selection at Flamengo before attempting to do the same with the Seleção. Although the propaganda effectively screened his regime’s atrocities, there was a tad bit more resistance than Médici had grown used to. Unsurprisingly, Médici fired Saldanha. He was replaced by a member of Brazil’s 1958 and 1962 World Cup winning squads, Mário Zagallo. Médici subsequently took a step back from the inner dealings of the Seleção, opting to propagate from afar in lieu of man management. Brazil, living pessimistically enough, had now lost all hope for their national team as well, while Zagallo quietly went about his ways. Zagallo had one main initiative: to field Brazil’s best under one tactic. Brazil had a plethora of number 10s – Rivellino, a slick dribbler with an atomic left foot, Jairzinho, a fast dribbler with the strength and incision to pass any man, Gérson, a midfield maestro with the passing range to hit any tree, and the aforementioned Pelé and Tostão. Zagallo used the 4-2-4 formation Brazil played at the 1962 World Cup as the blueprint tactic for this team. 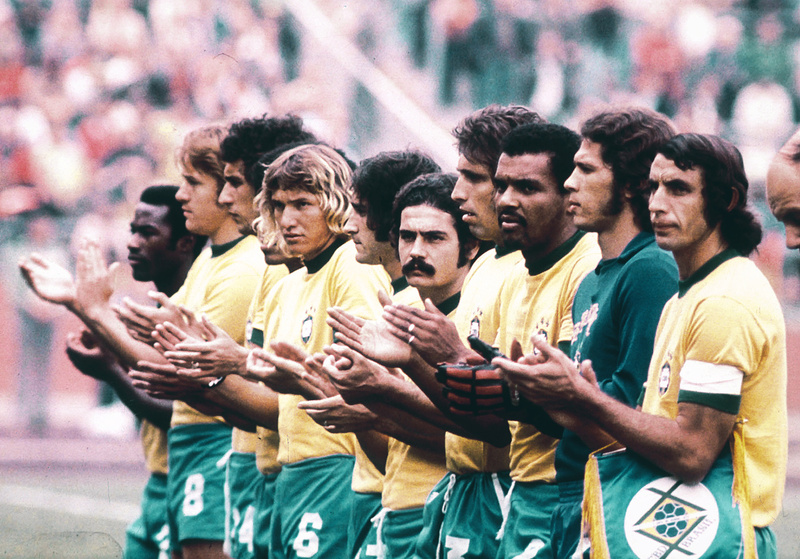 In goal stood Félix, Carlos Alberto – the captain of the side – Piazza, Brito and Everaldo made up the back four, Clodoaldo and Gérson operated as the midfield pivot, Jairzinho and Rivellino occupied the right and left flanks respectively, and Pelé and Tostão were the striking partnership. There were, however, a number of tactical tweaks. Pelé played slightly deeper than Tostão. He was the pivotal playmaker, the closest to a classic number 10. Tostão, wearing the famous number 9, resembled more of a false 9. He roamed across the front line, often dropping deep to contribute to the build-up play and destabilise the opponent’s defence. With the centre-backs following Tostão’s runs, space would be created for Pelé or Jairzinho, the latter cutting inside from the right. Rivelino was a more unorthodox winger. He would drift into the centre, consequently creating a three-man midfield with Clodoaldo and Gérson, or taking up more attacking positions near Pelé. 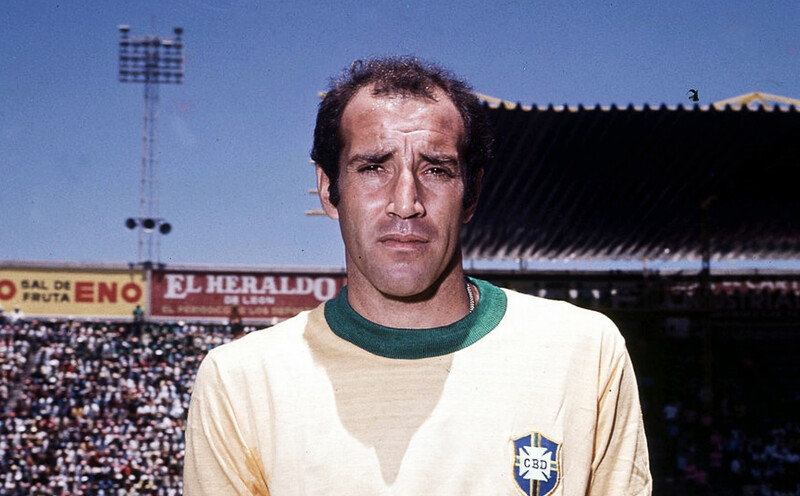 Carlos Alberto was instructed to bomb down the right flank when Brazil were in possession, leaving Piazza, Brito and Everaldo to cover for the whole team. Piazza was actually a midfielder; Zagallo insisted on him playing in defence to help with Brazil’s build-up play. This samba rhythm did not stem from any vast technical or athletic superiority, rather the expressive art of capoeira. Cruelly exploited under the governing regime, Brazilian slaves developed this dance-martial arts hybrid. Capoeira focused on free bodily movement, which the slaves were otherwise denied. It was the perfect antithesis. Each practitioner, finally able to freely express, felt euphoric. Capoeira became a tool of resistance – a dance, a movement that liberated one from the ails of the oppressing society. And in the 1930s, when black Brazilian players no longer had to powder their faces just to play football, this resistance-through-expression mentality truly became joga bonito. Thus, with mere weeks to go until the World Cup in Mexico, a sudden managerial change, and a nation suffering under oppression once more, meant the capoeira mentality held more prevalence than ever. Brazil looked to their 23 travelling players for some sort of escape. Few fans, albeit reluctantly, rooted against the Seleção, hoping their shortcomings would embarrass Médici enough to leave office. But to the nation as a whole, Zagallo’s men were to be an indicator of the future – if Pelé and co could succeed in such times, then Brazil could too. Luckily, they were enchanting. Drawn in a group against the world champions, England, the European champions, Czechoslovakia, and Europe’s newest sensation, Romania, Brazil’s chances were rated slim. Just four years prior, Portugal knocked Brazil out of the 1966 World Cup, evidently showing that Brazil could not cope with the European physicality. It was on 3 June in Guadalajara, Mexico that Brazil faced Czechoslovakia in their opener of the World Cup. Televised to the entire world in colour for the very first time, everyone tensely watched on. 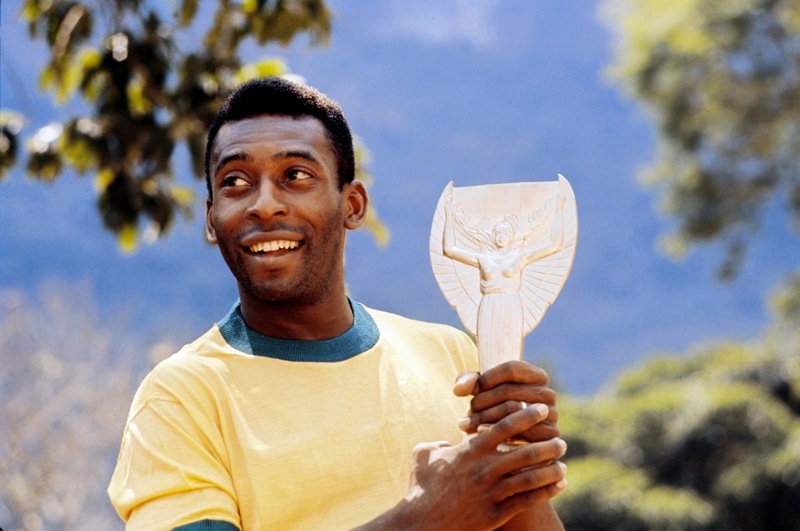 Pelé, absent from this same fixture in the final of the 1962 World Cup, kicked the game off. And so, the Seleção dazzled as the world marvelled. Brazil moved fast. They did not focus on hogging the ball nor defending deep. When in possession, they would swiftly play out the back and look for vertical passes to their attacking quartet. In truth, the team could play a myriad of styles but focused on quick combination play and instinctive movement. Pelé would often dummy the ball, leaving the pass for Tostão and continuing his own run into the box. Rivellino would fool opponents with his trickery, whilst Jairzinho posed a direct threat on the right. The world, seeing such sharp movements and trickery for the first time, could not help but watch. Czechoslovakia scored first, but Rivellino soon equalised with a thunderous free-kick. Before half-time, Pelé audaciously attempted a shot from the centre circle. He missed by centimetres, but the crowd cheered as loud as ever. Brazil looked to be even stronger after the break, with Pelé nonchalantly finishing a team move. Gérson soon found Jairzinho with an over-the-top pass, and the number 7 thumped the ball into the net. The Brazilian joga bonito was on display from the very start but, despite winning 4-1, there was cause for concern. Gérson had gotten injured. Gérson tied all strings together. His orchestration helped the team gel. Brazil felt confident to play the quick and simple passes around and through Gérson. But he was out until the remainder of the group stage, and a difficult game against England beckoned. The game was decisive. The winner would likely top the group and play in Guadalajara until the final, in lieu of Mexico’s more demanding altitudes. Gérson’s absence was strongly felt. Brazil struggled to pass the ball around as effortlessly as before. The attacking quartet now faced the challenge of breaking down Bobby Moore’s solid defence. Carlos Alberto in his later years admitted that it was the hardest game of the whole tournament – but a game Brazil nonetheless won. They managed to bypass England’s defence a number of times but met great resistance in Gordon Banks. In what looked a sure goal, Brazil went from their own third to the six-yard box in two passes and four touches, but Banks’s stretching arm miraculously kept out Pelé’s header in what many refer to as the save of the century. Eventually, when outnumbered six to three in England’s own penalty box, Tostão found Pelé with a cross, who laid it off to Jairzinho for the winger’s second goal in as many games. It was a physical, demanding game but Brazil had passed their hardest test without their most crucial cog. Qualification was now guaranteed. In their final group stage game against Romania, joga bonito was a different animal. Still without Gérson and with Rivellino rested, Brazil wanted to ensure their victory early on. They carved holes in the Romanian defence. Pelé and Jairzinho put Brazil 2-0 in a blitz before even half an hour was played. The Romanian goalkeeper, Stere Adamache, was even subbed off for someone fresher and more confident. But Brazil’s lax defensive structure and insistence on playing out the back was proving problematic, as Romania soon capitalised on a misplaced pass. After half-time, Pelé restored the two-goal lead with a predatory finish from inside the box. The ball had gotten there after an inventive flick from Tostão. Brazil was expressing itself and coasting, the world riveted by their football. Hope was trickling its way back into Brazilian life. In the quarter-finals, Brazil faced their first South American opponents, Peru. Gérson and Rivellino had returned to the side. With Guadalajara watching, Brazil proved that in football, greatness and flexibility are synonymous. For 90 minutes, they did everything. They could create chances in all forms, be it a short corner, a pass over the defence, overlapping runs from the full-backs – Brazil terrorised Peru with undefendable flicks and tricks. Rivellino scored the first with a deft, powerful finish to the bottom corner from the edge of the box. Tostão scored the second after a short one-two from the corner with Rivellino and a near-post finish. With a simple tap into an open net after Pelé had chipped the ball over the onrushing keeper, Tostão scored another. To cap off the spectacle, Jairzinho rounded the Peruvian goalkeeper and slotted the fourth into an empty net. The game finished 4-2 but the two Peruvian goals were more flukish than anything. Such was the gusto that the Seleção felt for football, they simply wanted to play, to entertain, and to do so together. From their carefree attitude stemmed their tactical flexibility. Where the Europeans would position their players with meticulous instruction, Zagallo would license them to freely roam. No player in Brazil’s attacking quartet, bar Jairzinho, had a defined position. Tostão, in lieu of leading the line, could either drop deep to join the midfield or pick up the ball on the left wing. When one player would leave his position, another would compensate. In the absence of a leading man, Pelé would push forward becoming the sole focal point of the attack. In such times, Rivellino would adopt the mantle of having dictatorial freedom in the centre. He could accompany Gérson in the midfield pivot, link up with Jairzinho on the right, or play right underneath the striker – be it Tostão or Pelé. Such free movement greatly destabilised Brazil’s opponents. What was the right-back to do if Rivelino is casually strolling on the other flank? How were the centre-backs to react of Tostão was playing in midfield? Follow him out of position and you leave free space for Pelé to exploit. In a game of little options and no leeway, Brazil’s opponents could just watch. As these 11 spectators trembled in fear, millions of others gasped at the canary shirts wreaking havoc on their televisions. Hitherto the semi-finals, it seemed little could object Brazil’s free-flowing, attacking football. South American rivalries are a fiery bunch. Each nation takes great pride in its footballing achievements. The fans, holding little direct influence on any result, succumb to two chief vices: pessimism and hyperbole. Brazil were to face Uruguay in the semi-finals. Such a fixture had been played out once before at the World Cup, in the final of the 1950 edition. Uruguay had won that game, and at Brazil’s iconic Maracaña. Naturally, Brazilian fans were expecting a repeat. There was little cause to feel hopeful or optimistic about Brazil’s future in any regard given the ongoing political crisis. Many thought that nothing would go their nation’s way. Their fears were soon realised. Uruguay had started the semi-final on the front foot. In a tactical tweak of their own, Uruguay assigned players to shadow Pelé and Gérson’s every movement. Pelé could shake his marker off easily, but with Gérson rarely in free space, Brazil suffered. A free-roaming tactic could only be applied on the basis of a vital, anchoring cog. The same players that tormented defences all summer could no longer find one another with a pass. Uruguay, as aggressive as ever, seized their chance. They took an early 1-0 lead as the ball rolled slowly past the planted feet of the non-reacting Félix – a man embodying a nation. With time, however, Brazil grew into the game. Their moves were penetrative, but Uruguay still looked unlikely to concede. But Gérson’s influence on a football match came in many forms. With half-time looming, he told Everaldo to start making attacking runs from deep. It only took the left-back one try. He ran into the penalty box and volleyed in Tostão’s cross. It was Brazil’s most crucial goal of the tournament. Now tied at 1-1, they knew that in the second half Uruguay would have to eventually open up to score. It was no longer a game of catch up. The second half saw a different Brazil, a hungrier Brazil. Pelé was the first to come tantalisingly close. A dangerous diagonal pass on the edge of the penalty box called for two takers, Pelé and the onrushing Uruguay goalkeeper. With the latter at full stretch, Pelé let the ball roll, escaping him and Mazurkiewicz. Now alone in the penalty box with only one Uruguayan defender on the goal line, Pelé ran onto the loose ball but unfortunately shot it wide in the most iconic goal that never was. It was a taste of what was to come from Brazil. Jairzinho turned the game. Tostão, from deep, played him a wonderful pass that left the Brazilian with one defender and the goalkeeper in his sight. He outpaced his man and slotted the ball into the bottom corner. Rivelino then secured the 3-1 victory with yet another strike from the edge of the box. The Seleção had laid Brazil’s fears to rest. The past was to hold no bearing on the present. A country at its lowest point and facing an opponent to whom it felt inferior to most, was now en route to the World Cup final. Life in Brazil no longer felt so dire. June 21 saw a mouthwatering clash at the Estadio Azteca as Brazil’s joga bonito took on Italy’s catenaccio. Free, attacking football took on defensively astute, ruthless counter-attacking football. Zagallo expected the Italians to man-mark his players as the Uruguayans did before. To counter their measure, he instructed his men to keep possession and constantly pass the ball around to exhaust the Italians. It worked to perfection. Throughout the game, Rivellino continuously moved central, with his marker following suit. Brazil focused on keeping the ball in areas where their players were in the numerical superiority. Clodoaldo, Gérson, Rivellino, Pelé and Tostão kept it circulating in the centre, essentially playing cat and mouse with the blue shirts. The aim was to draw out as many Italian markers from their defensive shape as possible, and then exploit the open spaces. But Brazil were rarely one dimensional. Their first goal came from a throw-in. Taken short to Rivellino, he lofted it into the air towards Pelé. Brazil’s star man out-jumped his defender and headed the ball into the net, aptly scoring Brazil’s 100th goal in World Cup competitions. Brazil’s insistence on keeping possession and playing out the back once more cost them dear. The Italians capitalised on a misplaced pass within Brazil’s own defensive third and equalised before half-time. After the break, Brazil didn’t change their approach; instead, they upped a gear. Their passing now swifter and more purposeful, clear-cut chances were still hard to come by, but the Italians were growing shaky. Brazil had penned them into their own penalty box and two Italians markers would step out of line to greet any approaching Brazilian. Jairzinho tried dribbling his way through. Losing out in a tackle, the ball landed to Gérson. He shuffled it slightly to the left, fired through the minuscule gap in Italy’s defence and into the net. Brazil had retaken the lead and Italy were forced to start pushing higher up the pitch. Brazil had altered their tactics accordingly. Still circulating possession, they now searched for direct passes to its attacking quartet through the Italian lines of press. Such a ball was lofted from the middle third towards Pelé in the penalty box. He cushioned it down into Jairzinho’s path and the powerful winger scored his seventh goal of the World Cup. The final was Brazil’s spectacle. Winning 3-1 and radiating confidence, Brazil kept the ball circulating as the Italians laboured behind. It came to Rivellino’s feet at the left corner of the penalty box. One Italian defender stood right ahead with another immediately behind. Rivellino stood his man up, and with the ball at his left foot, performed the elastico in one swift motion. The ball had went through Bertini’s legs and out again so cleanly it had to be magic. The world, seeing the trick for the very first time, could but marvel. The stadium now roaring, “Brazil! Brazil! Brazil!”. One more act of artistry was on its way. The play started in Brazil’s own third. Tostão had chased the ball all the way back from attack. The final whistle now minutes away, Brazil pinged a few short passes together. The ball came to Clodoaldo’s feet and a screen of four blue shirts stood ahead. With a myriad of step-overs, his long legs tipped and toed their way through each oncoming challenge before passing the ball to Rivellino deep on the left flank. Still in his own half, Rivelino played a long vertical pass to Jairzinho. The Italians were now heavily concentrated on the left, trying to dispossess the powerful winger. He passed the ball across the pitch to Pelé, who stood at the crown of the penalty box. The Italians, dazed and yet to catch up, could only watch. Pelé rolled the ball into the path of Carlos Alberto. The right flank of the pitch was entirely free. The right-back had galloped from defence into the Italian box and struck a first-time rocket to seal off a 4-1 win. 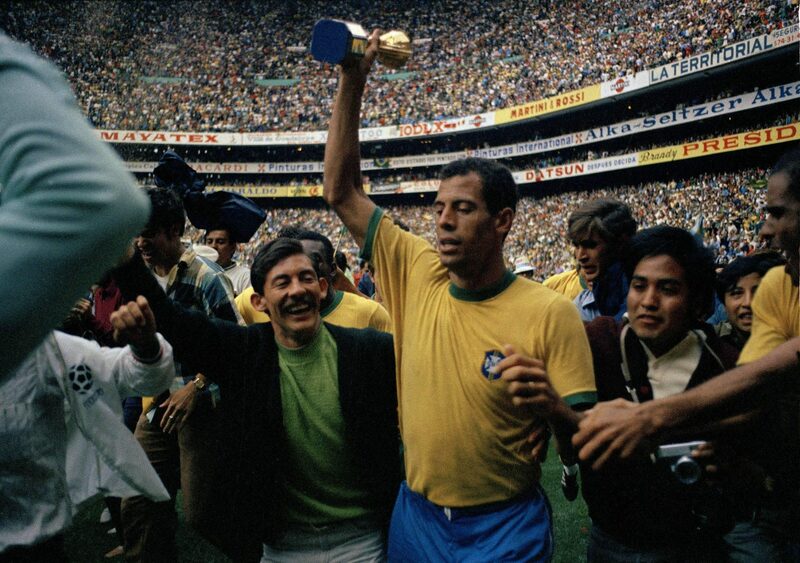 The move encapsulated Brazil’s legendary football of 1970. It was a team that made grown adults gawk. One that could do it all and make it look so effortless. But when a team that played a mere six games nearly half a century ago is considered the greatest of them all, any rational cynic would disregard the notion as romanticism. Brazil won all its plaudits on merit. It was the first nation to win all its games at the World Cup; the first to have a player, Jairzinho, score in each game; and the first nation to become a three-time world champion. Brazil did it in first-class style. When Zagallo was appointed manager, he later admitted, he did not have to do much. The players had a perfect understanding and each was capable of winning matches single-handedly. Zagallo merely fixed the tactics and physically prepared them for Mexico’s high altitudes. Their brilliance was innate. None of the Brazilian players were playing in Europe and were largely unknown. As a result, when the world tuned in to see the famous yellow shirt and short blue shorts donned by 11 strangers, it fell in love for many a reason. It was their story: an oppressive dictator presiding over a country in peril and a team gunning for glory to salvage some form of happiness for its despairing countrymen. It was their players: strong, fast, skilled, each capable of inventing a priorly unseen moment of magic. It was their football: quick, imaginative, and full of flair, Brazil set the precedent for a fluid and potent offence. It was joga bonito – the zest to play beautifully.